Crocodile spotting in Goa near island is for the adventurous. You can enjoy the thrilling experience of getting close to crocodiles in their natural setting without disturbing them at all. 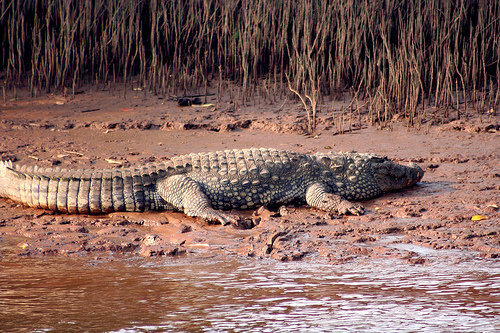 Crocodile spotting tour, by private yacht, which doubles up as a river cruise through the backwaters of Goa. In the narrow creek that intrudes into the thick mangrove jungle near the small village of Cumbarjua. Drive the yacht through Mandovi.You will pass along the swampy, marshy lands of Chorao island as you progress on your crocodile watching trip in Goa. Private yacht takes you to Cumbarjua Canal. This Canal is the link that connects the Zuari and the Mandovi River. The 15 kms Cumbarjua canal connects the two main rivers of Goa---the Mandovi and the Zuari. Cumbarjua canal holds about 40-50 Crocodiles. Watching Crocodiles in Goa is a experience worth going through.